Special Buys Week 15 has a part of sleepwear products like coral fleece robe. Visit pg 2-3 for the sleepwear products that are fancy and comfortable. ALDI Catalogue is for the whole family this week. 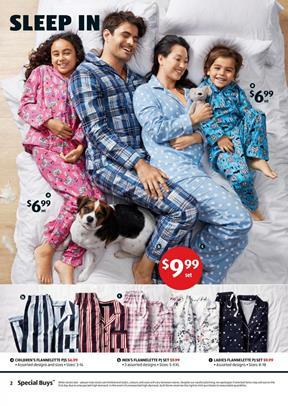 Men's flannelette PJ set will cost only $9.99. Feel comfortable at the top level with high-quality fabric and browse a wide range of products on the current browsable catalogue. Knitwear sale is also available. Ladies knit PJ set will cost only $13.99! ALDI bedroom sale covers a modern range of bedding products, too. Buy flannelette fitted sheet set queen size for $49.99 at ALDI stores on 10 April. You can find colours in the kitchenware shelf. Make your kitchen a fashionable place and enjoy cooking or even being in it. Find mini coloured pans that are only $4.99 on pg 8. With the products of special buys week 15, create a playroom for kids, buy bathroom toys, and renew your laundry tools. Also, super savers on some meat and chicken products are available on pg 16&17 of the latest ALDI Catalogue.